You can safely bet on your favourite Cavendish Venues for the best value prices in the market. 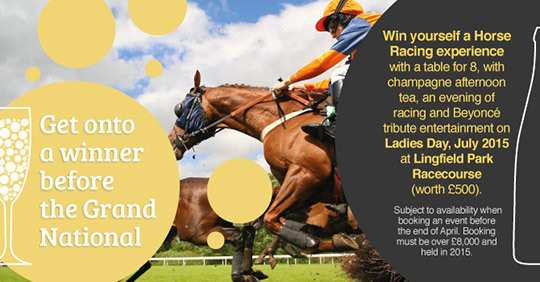 Now place your event by end of April to take place within 2015 and you can win a hospitality experience for 8 on Ladies Day at Lingfield Park! So to be in the running for this fantastic prize, just be first past the post and tell us your event is good to firm by end of April 2015. The Winner will be subsequently drawn and announced. Terms & conditions apply: Event must take place in 2015, new bookings only, be valued £8k or above, subject to availability, prize worth £500 includes an exclusive table for 8 with Champagne Afternoon Tea before evening racing and Beyonce tribute entertainment on Ladies Day in July 2015 at Lingfield Park.